As March winds down, I am completing work on a Nutritional Scavenger Hunt I’ve been chipping away at all month. The challenge was provided by the dietitians at my local gym and has really motivated me! One of the tasks was to prepare some provided recipes, and when I tried this one, I knew I had to share it with you. I’ve been doing a lot with quinoa lately. I don’t know why it took me so long to get on board with it, I avoided it thinking it was complicated. 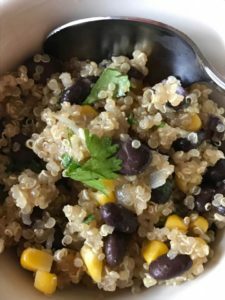 Friends, quinoa couldn’t be simpler to work with and the results are delicious and nutritious! Heat oil in a medium-sized saucepan over medium heat. Stir in onion and garlic to saute until lightly browned. Mix quinoa into saucepan and cover with vegetable broth. Season with cumin, cayenne pepper, salt and pepper. Bring mixture to a boil. Cover, reduce heat and simmer 20 minutes. Stir frozen corn into saucepan, continue to simmer about 5 minutes until heated through. Mix in black beans and cilantro. This recipe yields ten 1/2 cup servings at 76 calories each with 2.6 grams of protein and 1.9 grams of fiber.